Reduced mannequin. Reduced training mannequin is manufactured in accordance with the dummy model figure. It is a reduced copy of a proportionally composed of a female figure with a normal posture. The presence of such a mannequin will allow a better understanding of the material concerning the fit of the clothing on the figure. In the study of cutting is more important than exact matching of the clothes the figure than its conformity to the fashion. Measurements with a reduced mannequin is removed by the scale of the centimeter. The obtained values correspond to the measurements of shapes, such as, bust is 96 cm, waist girth equal to 68 cm, etc. to complete then the drawing on the thumbnail dummy, use a scale ruler. Then, taking a ruler with the usual divisions and using the same values of the measurements, you can make a pattern in full size. The concept of basic and working patterns. The basic pattern is a scan in the plane of the surface of the human figure. 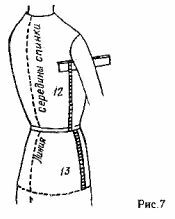 If you cut out the fabric according to the basic pattern, you get a shell that fits the body of the person without wrinkles or creases, not constraining movements (figure 1 ) . The drawing model is based on the basic patterns. The accuracy performance of the basic patterns depends on the elegance and fit of future products in the figure. The basic pattern does not depend on fashion. When it is built account for some surface shapes (around the neck, shoulders, waist, etc.). The method of constructing the basic patterns, designed for mass and individual tailoring are the same. The working pattern is intended for cutting items of a certain model and size. 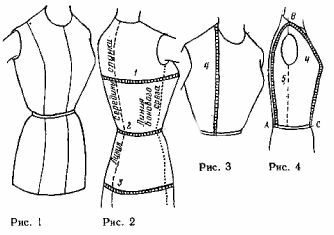 There are three kinds of work patterns: patterns are made according to basic patterns, based on standard sizes; patterns are made according to basic patterns obtained on the basis of individual measurements, and patterns for clothing of the highest quality, manufactured according to basic patterns obtained by using dummies for the particular figure. 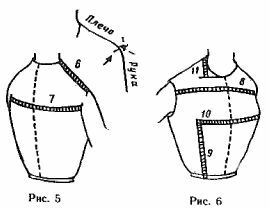 The method of making working patterns for dresses, coats and other products are the same. Measurements. To perform basic patterns you need to have certain measurements. They can be taken from tables of measurements on the model shape or is obtained by measurement of a human figure, dressed in a gown of thin fabric, not giving excessive allowances. Before taking measurements, you should figure belting at waist slightly loose ribbon, located horizontally. When taking measurements of girth should be on the back of the person measured. This is especially important when removing the measurements of the bust, as the tape must be placed on the blades. On the most projecting parts of the figure (Breasts, buttocks) tape placed in a horizontal position. The measuring tape should not be pulled tight or held too loosely. Taking measurements is shown in figure 2-7. Measurements indicated on the drawings numbers. The obtained measurements recorded in the table . Chest 1 (see figure 2) is measured, with a tape measure on the most protruding points of the chest and shoulder blades (96 cm*). Waist circumference 2. measure waist, without pulling the measuring tape (68 cm ). For skirts with a tight waist tape should gently pull. In this case, measure both values of girth. Hip 3-meter at the hip line horizontally, given the protrusion of the abdomen (97 cm ). The length of the front to the waist 4 (see figure 3 and 4) is measured from the point of intersection of the shoulder line from the neck to the waist line (46cm). The measuring tape is positioned vertically or slightly decline to pass on the most protruding point of the breast. To prevent errors when removing measurements, you need to find a point In (see figure 4 ) , putting the figure in profile. Length of back to waist 5 measure from the waist up so that the tape passed vertically through the most projecting point of the blade. The first measurement is point a ( when measuring the length of the back to the waist along the spine is not taken into account the convexity of the blades). For controlling measurements of the front to the waist should be 4, not taking the tape measure from point b, continue the measurement to the waist line front (to a point). From the measurements obtained ABC (88 cm) subtract dimension equal to the length of the back, and get a scoop of 4 (88 – 42 - 46 cm ). Error can only occur due to incorrect determination of the position of the line of the shoulder or improper location of the belt; they should be checked again. The length of the shoulder 6 (see figure 5) measured in the middle of the shoulder from the neck to the intersection of the shoulder line with the line of openings (14 cm ). The width of the chest 8 (see figure 6) is measured from one hand to the other, as the width of the back (34 cm). The tape should be held approximately 5 cm below the base of the neck, but should not protrude into the bulge of the breast. The situation of the most exposed points of the breast is determined, taking 9 measurements from waist line to these points (20 cm ) and scoop of 10 between the most protruding point of the breast (21 cm ). Measure 10 measure, placing the tape horizontally. The depth of the front neck 11 is measured from the top of the shoulder line, placed horizontally at the base of the neck (8.5 cm ). The depth of the openings 12 (see figure 7) measure from the top edge line located under the armpit to the waist line (18.5 cm). The length of the skirt to the line 13 and the hips measure at the waist line to a line passing through the widest part of the buttocks (20 cm ). The length of the skirt measured from the waist line in front, continuing the measure 4 (see figure 4 ) . The length of the dress, potrebnogo at the waist line, measure from a point to the desired level. * Given as examples here and further the numbers in parentheses are measurements taken with the model of the shape measuring tape.